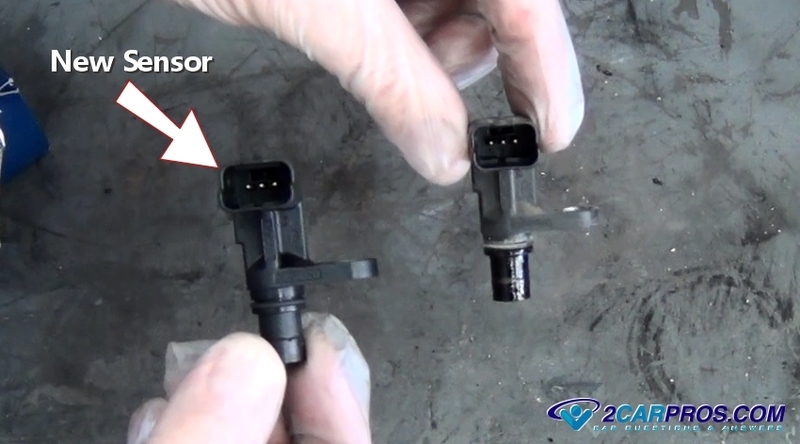 Learn how to replace your car's engine camshaft sensor. We are a team of ASE certified mechanics that have created this service guide to help you save money. Your engine's camshaft position sensor is designed to count the rotations of the camshaft inside the engine as it is running. Using a metal timer somewhere on the camshaft this sensor uses a magnetic field which is built up and then broken down which counts as one revolution. This information is then sent to the cars computer and is then figured into the equation of the operating program. This sensor can have the abbreviation of CMP or CMS. The cam sensor is located in the valve cover near the top of the engine or they can be located at the front or rear of the cylinder head as in the picture below. 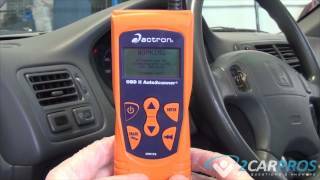 When a cam sensor goes bad it will cause the check engine light to come on and produce a trouble code. It can also cause the engine to run rough while the car is at cruising speed or at idle. 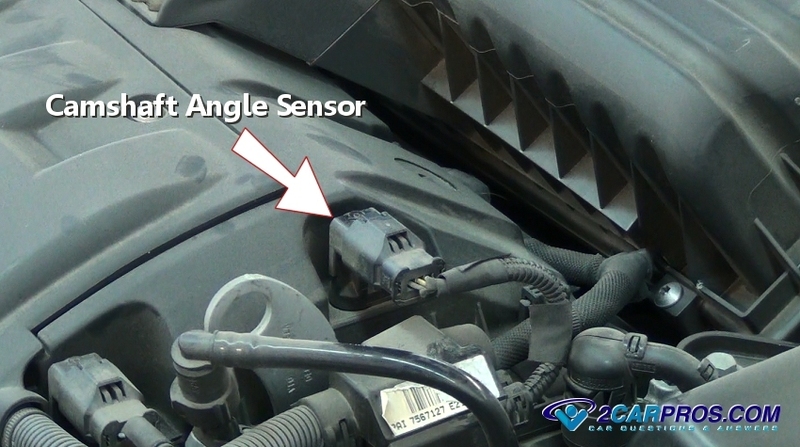 Due to the lack of feedback information to the computer this sensor problem can cause an engine stumble or hesitation. 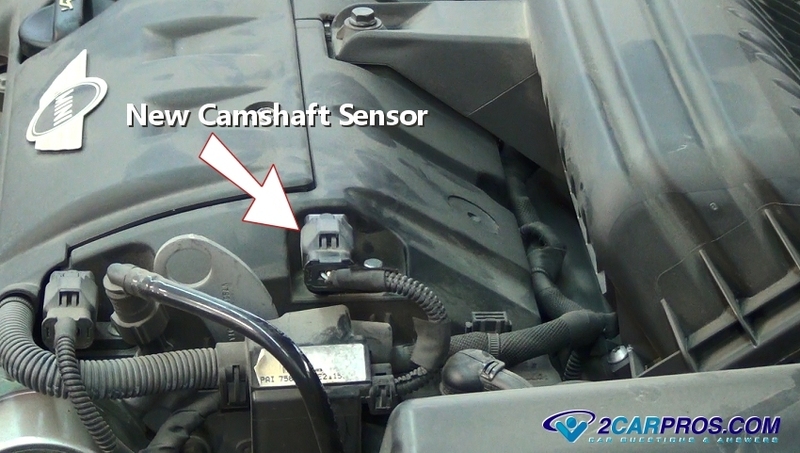 Though some think the engine will not start if this sensor goes out but this is simply not true because the computer will always use the crankshaft angle sensor to allow the engine to run. Inside the cam sensor there are small gauge copper wires that are subject to the heat and vibration of the engine. Over time these windings can break or short circuit which hinders the ability of the sensor to read the magnetic rotation of the camshaft. When the camshaft angle sensor goes bad one portion of the information needed to operate the engine is lost. Fortunately the computer will have enough information from the remaining sensors to keep the engine running. The computer will then substitute an alternative value for the missing data. This action causes the engine to loose a small amount of power and fuel economy. 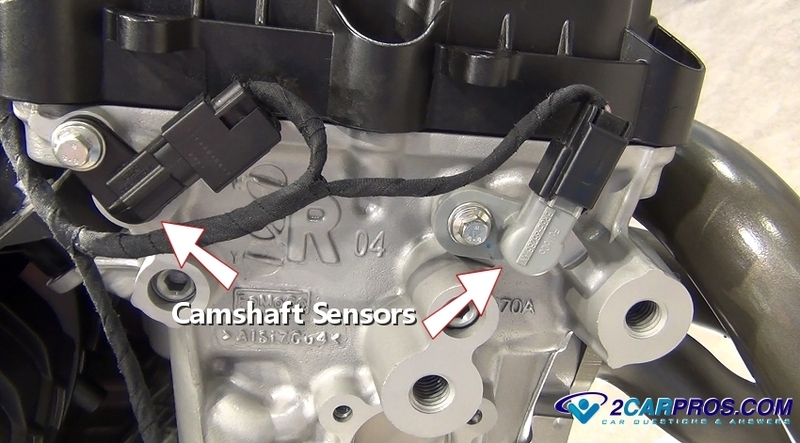 Camshaft sensor service costs will vary per manufacturer and depend on the location of the sensor. If you are having the job done at a repair shop or at the dealer it will cost between $180.00 and $250.00 (US). Whereas if you where doing the job yourself the sensor alone will cost between $25.00 and $65.00 (US). How Long Do Cam Sensors Last? 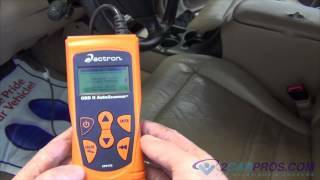 These sensors should last the life of the car and do in most cases, but as with all electronics they can fail at anytime. Then follow down the guide to pick up addition tips and information that is updated regularly. Begin with the vehicle on level ground in park with the engine off and the emergency brake set. Though engine appearances will vary the process is similar for most vehicles. You can get the replacement part and tools from Amazon or the local parts store or car dealer. 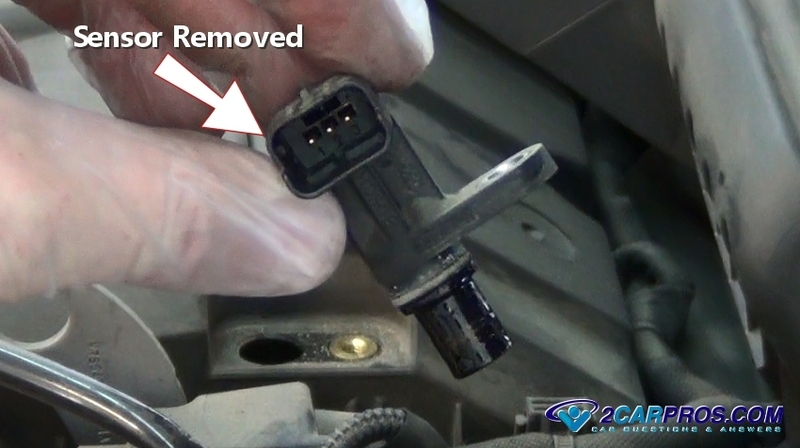 Remove Camshaft Sensor: Locate the sensor by inspecting the front, rear and top portion of the engine. These sensors are in pain sight and will have a two or three wire connector attached to them. Use a small flat blade (standard) screwdriver or pick to release the electrical connector tab to remove connector from the sensor. Gently pull the connector out from the sensor. It can be a little stuck due to the weather pack seal inside the connector which is designed to keep out moister. Using a 8mm or 10mm (in most cases) socket or wrench remove the camshaft sensor mounting bolt by turning it counterclockwise. There is usually only one bolt. 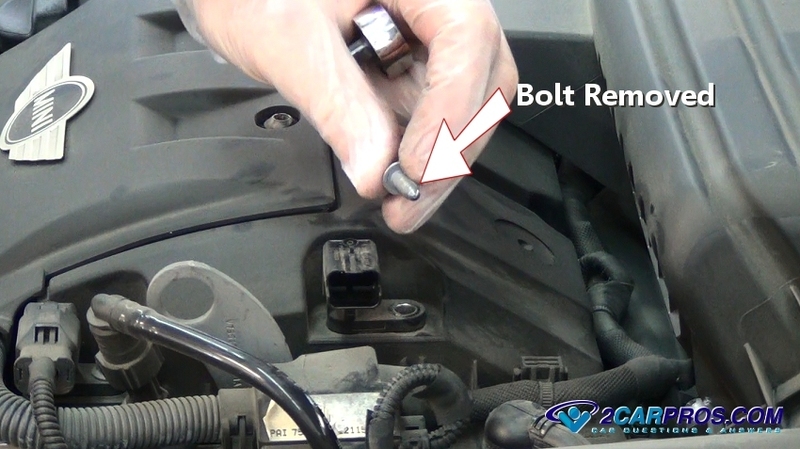 Sometime these bolts can be over tightened at the factory which causes the bolt threads to stretch and become weak. 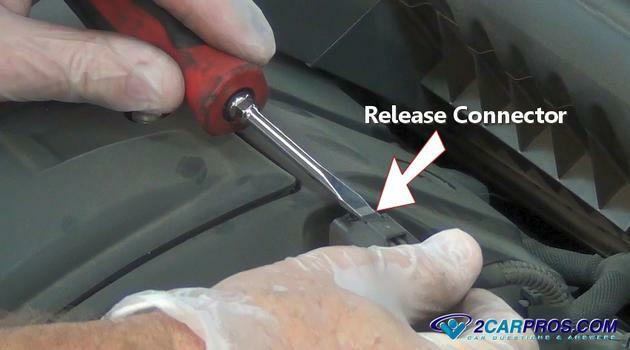 Inspect the threads for damage and replace the bolt if needed. Grasp the sensor and with a twisting motion pull the sensor from the housing. 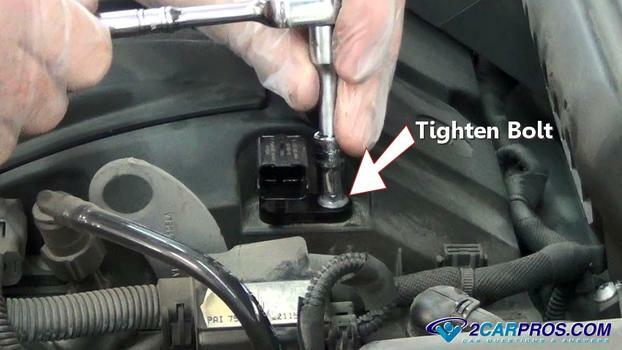 This too can be a little stuck because of the O ring seal which is designed to control engine oil. Once the sensor is free from its housing or mount inspect the electrical terminals for damage and corrosion which will hinder the sensor's performance. Install New Camshaft Sensor: After the old sensor has been removed wipe it clean so you and compare the new sensor to ensure a proper installation. 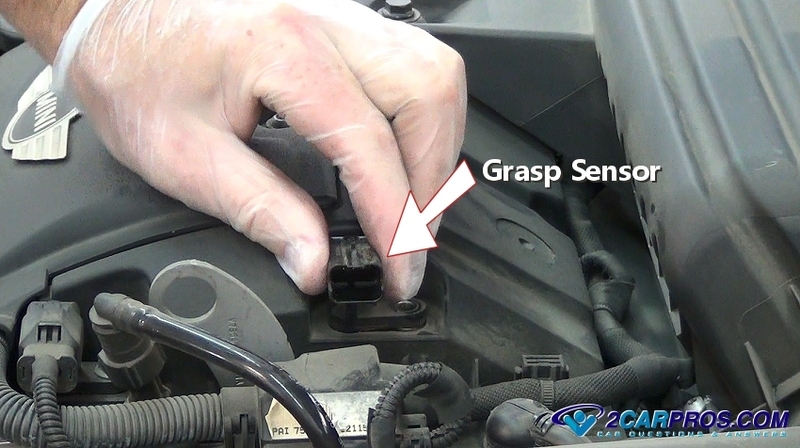 Be sure the sensor has a new O ring seal to avoid oil leaks once the new sensor has been installed. Occasionally there will be subtle a manufacturer update to the sensor which will change it's appearance slightly. Use a shop towel to clean the area which will help avoid leaks. 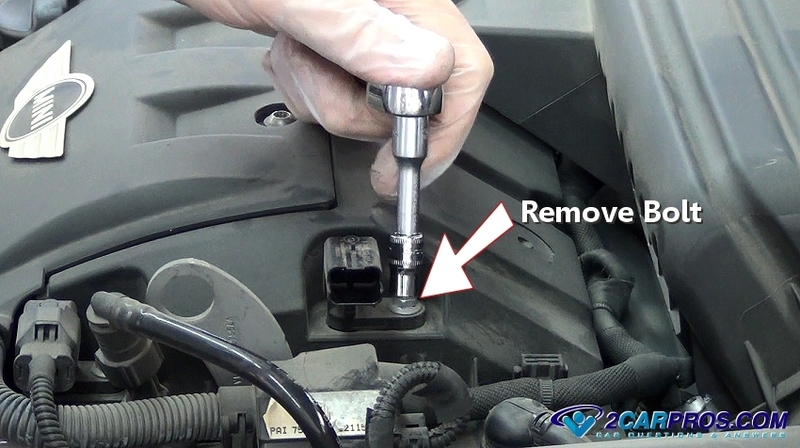 Then apply a small amount of engine oil or WD40 to the O ring seal and gently lower the sensor into position. The oil is to help lubricate the seal which will help avoid the seal from getting damaged during the installation. Insert and start the mounting bolt by hand to avoid cross threading. Avoid starting the bolt while using a socket. 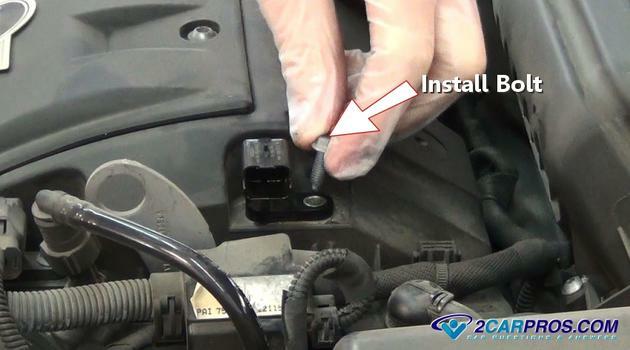 Use a small socket or wrench and tighten the sensor mounting bolt. This bolt does not need to be super tight because is only holds the sensor in place. The specification would be about 2 pounds of torque. 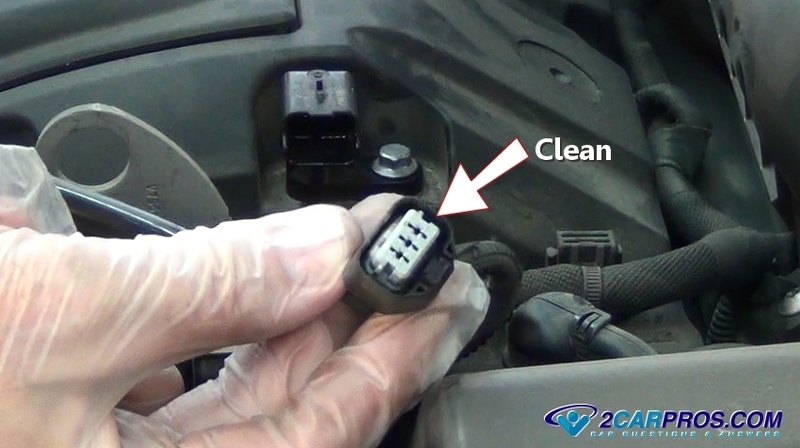 Inspect the wiring connector to make sure it is free from grease, dirt and corrosion. Clean if necessary before installing it onto the new sensor. 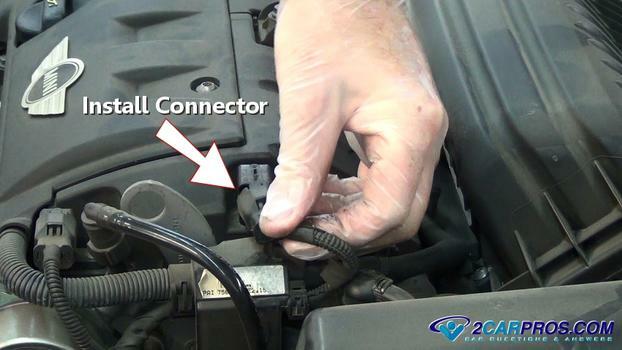 Inspect the wiring of the connector because this is usually where breaks can occur. Firmly install the electrical connector by pushing it inward toward the connector. You should hear an audible click when it is completely installed. 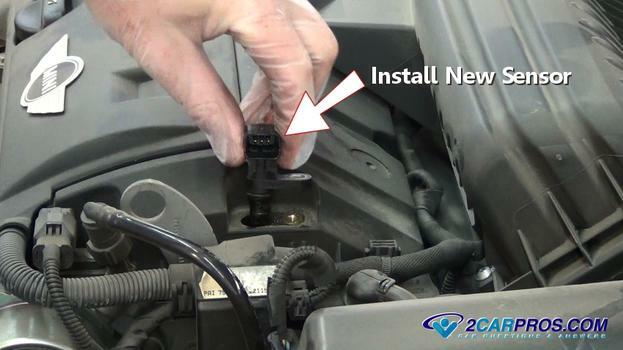 Once the new sensor has been installed double check the mounting bolt and connection to ensure a proper installation. Once the repair is complete connect your code reader to clear codes and start the engine. The code scanner will produce a "PASS" message to indicate your job's success. If you have any questions about camshaft sensors please visit our forum. If you need car repair advice, please ask our community of mechanics who are happy to help. Our service is always 100% free.